The clear skies and snow of last week were quickly replaced by milder weather that brought with it the low cloud and damp generally associated with a Lakeland winter. That only lasted a few days though, and it wasn’t long before the skies cleared and the hilltops, now without a covering of snow, re-appeared. 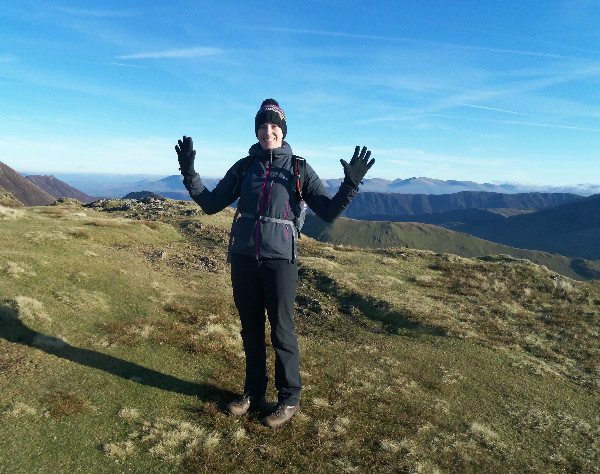 It was clearly time to get the walking boots back on, this time to tackle the mountain that is one letter short of being our namesake, Grasmoor. Although hidden from view from the Keswick direction, Grasmoor, at 852m/2795ft, is actually the highest point of the group of fells between Buttermere and Whinlatter, described by Wainwright first and many others since as the “North Western Fells”. Our route started at Rannerdale, by the side of Crummock Water, around 30 minutes by car from Keswick. 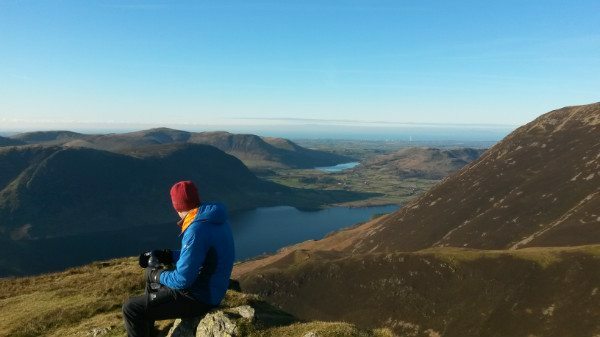 We aimed to tackle Grasmoor directly by way of the Lad Hows ridge, before the short down-and-up onto neighbouring Crag Hill, and a descent back to Rannerdale by way of Whiteless Edge and Whiteless Pike, a lower but no less dramatic peak. Rannerdale is a popular spot for walkers and tourists of all description, due to its stunning location alongside Crummock Water surrounded by hills, and its famous springtime display of bluebells. Consequently, there are 2 sizeable parking areas alongside the road where you can park without charge. The path to Grasmoor leaves the car park and goes pretty much straight up hill, initially following Cinderdale Beck. Unfortunately, this means you have no time to get the legs warmed up! 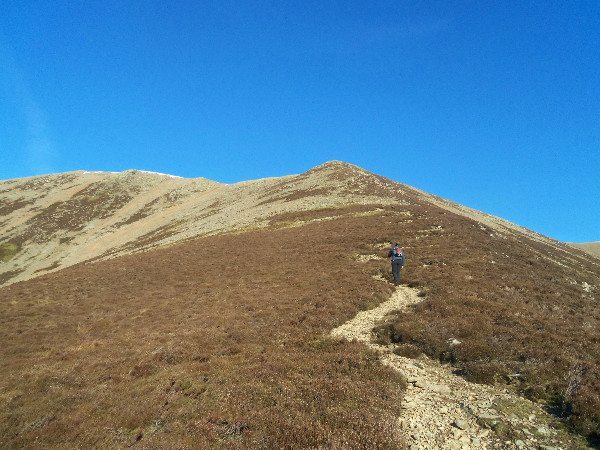 After a short climb, you arrive at the start of the ridge itself, which like many in the Lake District, is more of a broad, grassy buttress than sharp ridge. The gradient only slackens briefly, however, as the ridge rears up sharply and directly onto the summit plateau, becoming steeper and rockier the closer you get to the top. It is fair to say that this is not a route to be tackled without a decent level of fitness! Fortunately, the overall distance to be walked was not long, and after a lot of huffing and puffing, we arrived at the summit plateau, from where it was an easy walk to the large summit cairn. 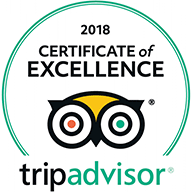 From here, you appreciate just what an exposed place this is, offering clear and uninterrupted views westwards to the coast and northwards over the Solway Firth into Scotland. 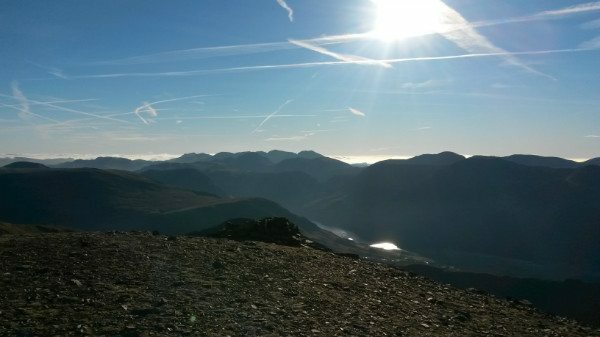 The views to the east and south are equally dramatic, with all of Lakeland’s higher peaks laid out before you. In fact, this must be one of the few places in the Lake District where you actually have a view of all of the highest peaks. 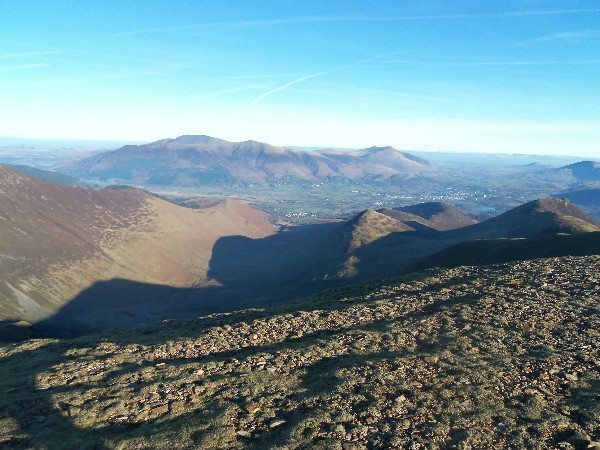 From Grasmoor, it is only a short walk due east along a wide path to the summit of Crag Hill, only slightly lower at 839m/2753ft. In fact, as you drive towards Keswick from the east, it is the large whale back of Crag Hill that dominates the view, alongside the lower but more shapely pyramid of Grisedale Pike. 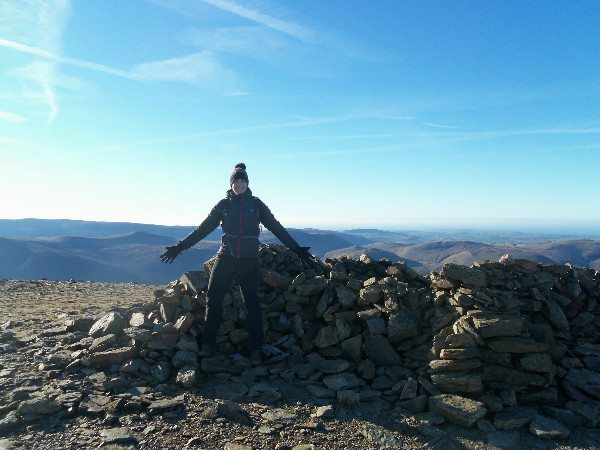 As the high point of the Coledale horseshoe, this is a popular hill – even in January there were plenty of people on the summit at the same time as us. From Crag Hill, a couple of paths fall south across the grassy and occasionally boggy hillside. If you follow the cliff top path, above Addacomb Hole, a drop followed by a slight rise brings you to the summit of Wandope at 772m/2533ft (which is a Wainwright for those interested in “Wainwright bagging”). We, on the other hand, followed the lower path which slants away from Wandope and heads more directly to the top of Whiteless Edge. Here the landscape suddenly changes from big, rounded, grassy slopes, to much more dramatic steep, rocky, Alpine style terrain. The edge itself, despite not being exactly razor sharp, is still rather narrower than most in Lakeland, and together with the distinct cone of Whiteless Pike (660m/2165ft) provides, in my opinion, one of the best sections of mountain walk in Lakeland. On either side the land falls away sharply by some 1000ft, with the roaring waters of Rannerdale Beck on one side and Mill Beck on the other clearly audible far below. Ahead lie the sparkling waters of Buttermere and Crummock Water, framed by the craggy northern buttresses of the High Stile range and the dramatically swooping Fleetwith Edge. Quite frankly, you feel so close to the main valley, but so much higher up, we wondered what on earth we were going to have to do to get down! Would we be scaling vertical cliffs? Fortunately not, as despite a steep initial section, the path falls onto a broad grassy hillside that curves around towards Whiteless Breast and the hamlet of Buttermere (eventually). Rather than continuing to Buttermere, we took the wide and obvious path through the bracken and alongside Squat Beck back to Rannerdale and the car. Our walk was around 6.7miles/10.8km and took us 4 hours, including a few stops. Difficult? Definitely, but also providing some of the most stunning views you will get in the Lakes!